Have you ever wondered how Financial Engines does what it does? 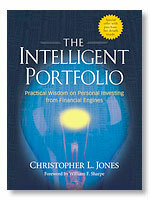 Now available, The Intelligent Portfolio by Christopher Jones, Chief Investment Officer, Financial Engines. Learn more about the people and the methodology behind the engines. behind the engines, who work on your behalf to help you achieve your retirement goals.